Courtesy of Nokia, I finally got my hands on the long awaited Nokia Lumia 920 this week. Nokia Norway took its time to announce when the phone was going to be available in Norway, and a lot of Nokia fans were relieved when the announcement of availability on November 28th finally came. This is three weeks later than in the US, and also more than three weeks later than the HTC Windows Phone 8X here in Norway. So the big question is: has the wait been worth it? And has Nokia lost some of the Lumia 920’s perceived momentum due to this late arrival? Windows Phone does not have a particularly large market share in Norway, despite being maybe the most innovative mobile OS out there. It remains to be seen whether the relatively simultaneous release of Windows 8, the Surface tablets and Windows Phone 8 will help in that regard. 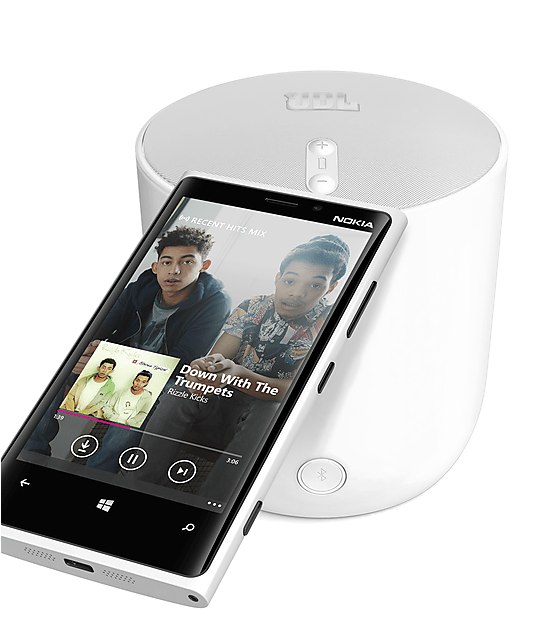 As far as I see it, the most significant Windows Phone 8 devices out there are the HTC Windows Phone 8X and the Nokia Lumia 920. Both appears to be beautifully designed devices, differing slightly in both hardware and software. Paul Thurrott of the SuperSite for Windows fame has completely fallen in love with the HTC Windows Phone 8X (you can find his review here), and I will compare my findings on the Lumia 920 with his conclusions on the 8X, since I have not been able to get my hands on the HTC device. 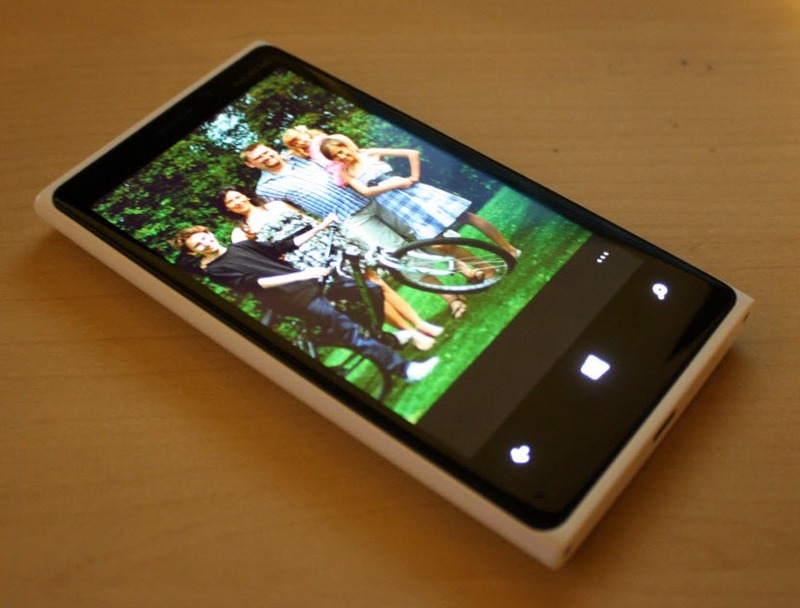 It was with a great deal of anticipation and excitement I received my review unit of the Lumia 920. Being as satisfied with the Lumia 900 as I was, I had great expectations for this phone, so you can say that the media and PR hype had worked on me. The box itself is quite similar to the Lumia 900 box, a blue cardboard-box with pictures of the device printed on the outside. The inner-box slides out and gives you the first glimpse of this beautiful piece of hardware. Underneath the plastic-wrapped phone you find the instructions, headphones and power plug and micro-USB cable. And that is it. Although a nice package, nowhere near as polished as Apple’s packaging. But then again, you only open this box once, so I guess it is the contents of the box – the phone itself that is interesting. The Lumia 920 has retained the basic design of the Lumia 900 and the N9 before it, with its unibody polycarbonate form factor. It is slightly wider and taller than the Lumia 900 (68,5 vs. 70,8 mm and 127,8 vs 130,3 mm) but a little bit thinner (11,5 vs. 10,7 mm). The Corning Gorilla Glass is slightly curved and fits into the unibody, where the Lumia 900s screen stood a little out of the unibody. Compared to my iPhone 4 and the Lumia 900 the 920 is a heavy phone with its 185 grams. The latest iPhone weighs in at the considerably lighter weight of 112 grams. That said, I have not in any way felt that this phone is heavy. It fits nicely into my hands (disclaimer: I have big hands ), and it feels just solid and sturdy. I find the design beautiful, even more so than with the Lumia 900, due to its slightly more curvy body and screen. The review unit was white this time around as well. I find the color nice, but would probably go for the black (or cyan – if it becomes available) myself. 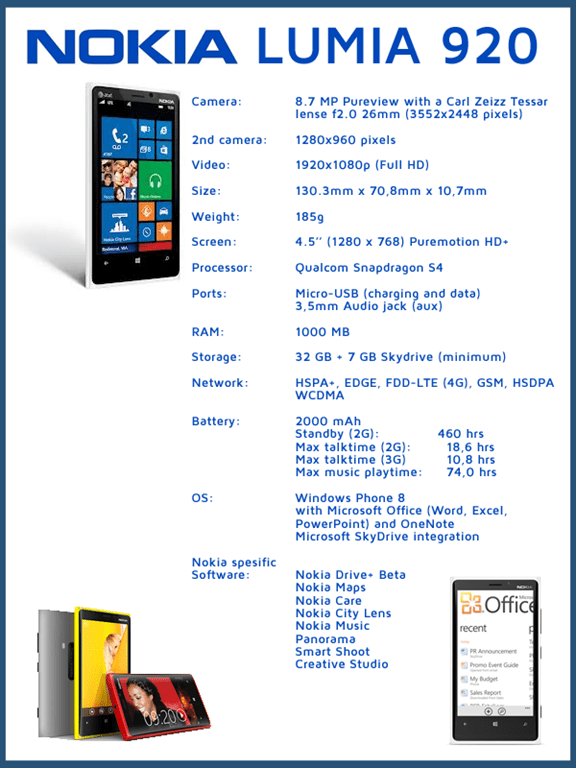 Windows Phone 7 limited the hardware specifications of the phones that came with that OS. One of the limitations was that the screen size could be a maximum resolution of 480 x 800. That limitation is no longer there and the Lumia 920 comes with a gorgeous 768 x 1280 resolution 4,5 inch screen. It has vibrant clear colors, although the blacks on this screen is not as black as the AMOLED screen of the Lumia 900. The 332 ppi screen has a higher pixel density than the Retina display of the iPhone 5 (326 ppi). Featuring Nokia’s ClearBlack display technology and a Super Sensitive Touch display, all the technology included means that not only is the screen easy to watch outdoors in bright light, but you can also wear gloves in the wintertime to operate the phone. Something extremely useful up here in cold Norway :-D. The outcome is crystal clear pictures, text and web-sites, on a screen that is just outright enjoyable to watch and touch. 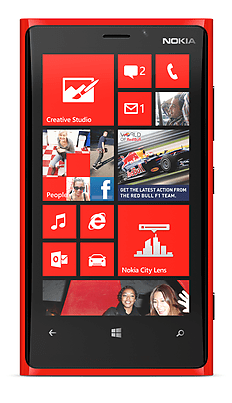 The display of the Lumia 920 is definitely one of the best displays on any cell phone on the market today! Phone reception and call quality on this phone is just excellent. In my house, which is situated on the edge of the 3G coverage area in my town, reception has been spotty on my iPhone 4. I have been lucky to have 2G coverage in most parts of the house, but in order to receive 3G I have had to step outside. On the Lumia 920 I have 3G in most parts of the house and even 3G+ (HSDPA) in some parts. Connectivity is thus not an issue, and as I stated initially, call quality is excellent. Given the range of radios in this phone I also expect to be able to travel the world without having any problems anywhere. Yet another top score for the Lumia 920! Nokia itself claims 460 hrs of standby time on a 2G connections, as well as a maximum of 18,6 hrs. of talk time on the same connection. That might be true, but not on my review unit. Initially battery life was abysmal. On a modern smart phone I don’t expect the battery life of previous “stupid” phones, where I could go several days without charging my phone, but I expect at least to be able to survive on a charge for at least the full day. That was not the case with my Lumia 920 initially. I had to recharge at least once a day in addition to the nightly charge, and it was sometimes outright scary to see how fast the battery lost power. Granted, I was giving the unit a lot more usage that I normally would use a phone. Constantly installing apps, playing games, testing the camera, checking email and so forth. On top of that the NFC was enabled, as was Wi-Fi and Bluetooth. My email was also set to constantly (real-time) check for new email, and I had allowed a lot of programs the ability to run background tasks. I have limited the applications that can perform background tasks to the following; AccuWeather.com, Aftenposten, Battery Level for WP8, and What Week Is It. I also blocked Nokia Drive+ Beta, as this application has been listed as one of the possible culprits. Has it helped? Yes, I am now getting what I would call normal battery life for a smartphone. It is still not great, but more than doable. When using the phone like I did with my iPhone 4, i.e. keeping it plugged in while driving to and from work (a 40 minute commute each way) while playing a podcast/audiobook, as well as what I would regard as a more normal usage pattern, my phone is at somewhere between 40 and 60% of remaining battery life when I plug it in for the night. I think the battery life issue is due to a firmware or OS problem, and expect Nokia or Microsoft (The HTC Windows Phone 8X also has some users report similar problems) to address this in the not so distant future. As of now this causes the lowest subscore of the phone. Stay tuned for parts 2 and 3. Any comments or questions? Please, feel free to post them in the comments section underneath.